Have you ever gone and done something; and realised later you should have waited? Well, this is what I've done here. I knew I was going out today to a place where there was a good bookstore and there was a bargain bin; however did I leave my 'July Book Buys' until Sunday? Nope, I was too darn eager. Silly me. 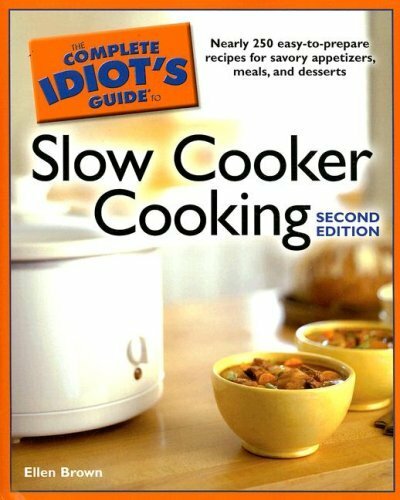 The first book I bought was 'The Complete Idiot's Guide to Slow Cooker Cooking' by Ellen Brown. Now, don't get me wrong, I'm a good cook, but get a slow cooker near me, and I'm a complete disaster. The results from these things often either taste like cardboard or worse; and I have to throw the contents out! So, this book was a must! I'm just as bad with a microwave; yes I grew up with them, but I'm not good anywhere near them. The next book looked good as it's 'The Islands' by Di Morrissey. I haven't read any of her work and have heard a lot about this book through Good Reading Magazine and so when I saw this at a quarter of the price, I thought it would be a good time to buy it. Well, these are the late-comers of the July Book Buys. Next month, I won't be so excited in getting up here... I'll try and wait out the whole month if I can. Until my next post, happy reading! I've had a great month of book purchases; of books that I've wanted to read and books that have surprised me. Then, I became extremely unfocused! How tedious is that? So, I stopped reading for a while and have been concentrating on something else: Spring Cleaning; which has brought me back to reading. How good is that? So, here they are. The books that I've bought this month! The first book is something I've wondered about on 'How I Met Your Mother' and now I have it, I found it a hilarious read. I bought 'The Bro Code' by Barney Stinson and Matt Khun at QBD Bookstore Garden City on the first week of this month. I was told by the shop assistant that it was the most popular book bought by women in the last year. The next two books were bought at The Book Warehouse at Springwood. 'How to Hepburn' by Karen Karbo and 'All Together Now' by Monica McInerey. The first one is all how Katherine Hepburn lived; while the second one is full of short stories of this great Aussie author; which I greatly enjoyed (and did a review on as well once I finished the book and handed it onto my Mum to read). I bought the classic Australian book 'My Place' by Sally Morgan, 'The Wendy House' by Imogen Edward-Jones and 'Angela's Ashes' by Frank MacCourt at the Thrift Store down the road from me for around $3.00 (this is including a nice Glo-Mesh handbag) while I was out and about for a walk on a nice warm Winter afternoon. I bought these on 14th, July and all I was doing was going for a walk on a lovely warm Winter's day; and these two books were a surprise to find. Well, that's all the books I've bought this month. Good finds, Classics and good fun reads in this lot! So, what have you found while out and about this month? Leave a comment and let us know. Until my next post, happy reading! I was reading a thread in Bookcrossing and the person was talking about the mention of books in books. I thought it was a very cool idea of having the title of somebody else's works inside your own work; as an author (an author's way of namedropping in their own circles). Then, I got to thinking about where I had seen this kind of thing before; and realised it was in movies where people have been sitting around reading books or have been writers or have run bookstores. So, I'm wondering have you ever paused to remember a title of a book that a character is reading in a film? Or if you were watching a dvd, have you written down the title and author of the book they're reading in the movie just so you can track it down and read it? 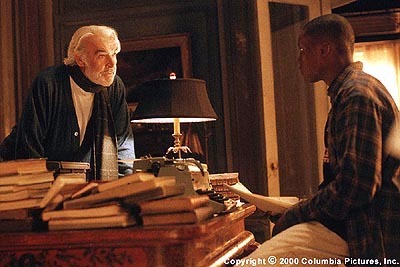 I remember when I was watching 'Finding Forrester' on dvd, I paused it right at the beginning when the camera glided up that pile of books in Jamal's room and copied down every one of the titles and authors; and tracked down a few of them just because they interested me. There have a been other times, like in 'Kingdom Hospital' the M.E. (played by Henry Rollins) is reading a different Stephen King novel in each episode; how very ironic of him, not to mention very cool! So, have you ever done this kind of thing? Or do you think it's to strange to copy down a book title you've seen in a movie just to see if it's a good read. Now you know I do, I hope you don't think I'm too strange about how I find some of my reads. Until my next post, happy reading! I'm going to approach an issue I've been having with Blogger and Firefox. Now, it's got to do with something that's been happening with Blogspot and Blogger have been trying to fix it. I have had problems with posting. When I click on the 'New Post' item in the top right corner, it comes up with the Edit page and not the Compose page. If you're having this problem as a fellow Blogger - you're not alone. There are plenty of Bloggers out there having problems like this; people who are using Firefox 4.0. I'm using Explorer to do my posts here; and if you want to try that out, it'll look like it's not letting you sign in, but once you get to the dashboard, just click on the little blue button which says 'New Post' and you'll come through to a 'Compose' window... easy. And you'll be on your way. I know this isn't about books; it's more about information than anything else. I just hope it's fixed very soon. Until my next post, guys, keep on following and happy reading! 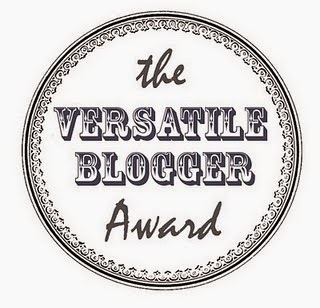 I've been trying to figure out what's going on with Blogger and it's editing problems. After waiting for what feels like an eternity, I was looking around their Help forums and found out that their new Editing system has been having problems.. .big ones.... and so I've had to go back to using the old Editing system; another one is to make this blog untranslatable. Sorry, people. You can translate this another way through putting the url through Google where there's a translation tool there. I hope I've helped you with everything you've needed. Have you ever had one of those months were you can't keep your head or nose in a book long enough to keep yourself interested? Over the last two months, I've been barely interested in anything; and it's frustrating me beyond belief! I have had books pretty much thrown at me from all directions, but no real need or passion to read them. However, I know for a fact that this is a temporary thing as it's happened before. Being unfocussed is something that happens to me when I need to clean out my house or get into my writing more (which really does need some work). I have tried to read some short story books - without success - and attempted reading a few other books that aren't really about anything in particular, but I'm taking a break from reading until I find my mind is going to be more focussed on my reading and less focussed on cleaning out my house... I believe I'm doing the old Spring Cleaning earlier than expected this time around! Have you ever had this kind of thing happen to you? If so, how did you get around it? Did it worry you, or did you just wait until the passion for the words come back? Until my next post, happy reading! Okay... it's time to kick back and use our imaginations. I've been reading about second-hand bookstores taking on a secret life of their own. One is in NYC that's gone secret and another is a floating one - as you have read in my posts below; and aren't they the coolest? 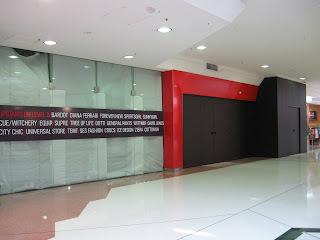 Now, what would you do if you had enough cash, your dream location and plenty of books to stock your dream bookstore? Where would to build it? What would you call it? What kind of books would you stock? This idea has been knocking around my head all afternoon and night and I just can't go to bed without writing it down (being a writer, when I good idea hits me, I must, must, must write it down otherwise I won't sleep). My dream bookstore would be here in Brisbane on a nice big piece of land in a Queenslander home. Each room would be stocked full of isles of books with good, tall bookcases, tables, lovely winged chairs, chaise lounges and bay windows to sit at to let in natural light with curtains and shades. There'd be fireplaces in two rooms so anyone who wanted to snuggle by the fire could do so in Winter and read to their heart's content. And there's be a large iron fireguard to keep the hearth clean and free from embers. Surrounding the house would be a nice, wide, covered verandah so people could go outside and have tea or coffee at their leisure and look over the well-kept property. Or better still, take their purchases out into the garden and spend the day reading under one of the massive, sprawling Jacaranda Trees around the place. The books I'd stock would be all second-hand. They'd be between $2.00 and $20.00 and in good condition. 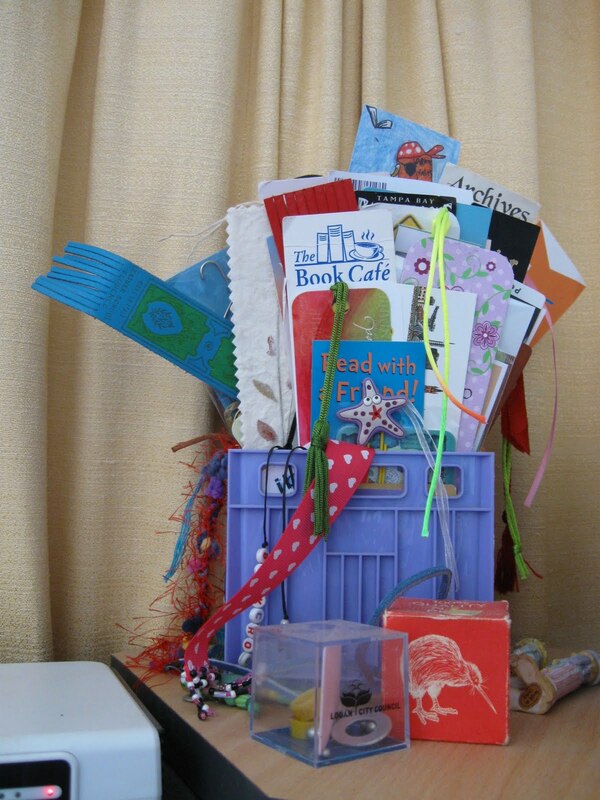 I wouldn't be selling anything that is falling apart - after all, you do want to have a good book to take home. I'd stock out of print and rare books so you can come and find those books you've been looking for for years; and yet they have been right under your nose here just on the outskirts of the capital of Queensland. My brother would have a branch of his coffee shop at my bookstore, for your convenience. His gourmet coffees would be served up to you after you've purchased your books as you sit out the back under the cover of a Star Jasmine vine and enjoy the peace and quiet to peruse your purchases and enjoy your coffee or tea with your eats. My bookstore would be called: 'A Book Collector's Delights' So, what would you do if you had the cash, your ideal place for a store and any kind of stock you wanted? As I was saying the below post, there is the demise of the second-hand and smaller bookstores all due to the larger ones pushing them out. So, with these smaller business closing down, they all have to go somewhere. Brazenhead Books - in New York - went secret. And now, there's another in the UK where the owner has turned a barge into a bookstore which will tour the canals around England; and there's plenty of those waterways in that country. This is another ingenious way of selling books; but at a slower speed than the hustle and bustle of the everyday rat race. For all of us who have massive book collections; and have thought of them as our own secret libraries, this man has taken his collection one step further. Being a bookseller for decades, he's turned his business away from the second-hand arena in New York City (as so many are being pushed out by the bigger, newer bookstores) and he now runs a hidden bookstore. The next time you're in New York, look him up in the phone book (no he doesn't have a business card) and call him. He most probably has the book/s you're looking for. This book is full of lovely short stories that range between three pages long and twelve pages long; with a novella at the very end called 'Odd One Out' (which was published as a separate book a few years back). The stories are unrelated to each other and are funny, very Australian and are ones which could be easily read over and over just because they are good enough on their own for something to dive into to kill time with or if you're looking for something to read in between major reads. 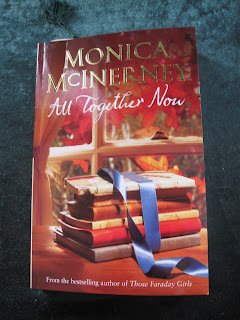 I've read Monica's work before and found that her books are light and easy on the mind and not too time-consuming; and yet they still pulled me into a good well-written, Australian story. Even though I've only read one book of hers, I have heard that her work is very family-orientated and have found her writing leaves me smiling at the end - with pleasure, humour or another feeling depends on the ending; but she puts in the most brilliant twists in her work. 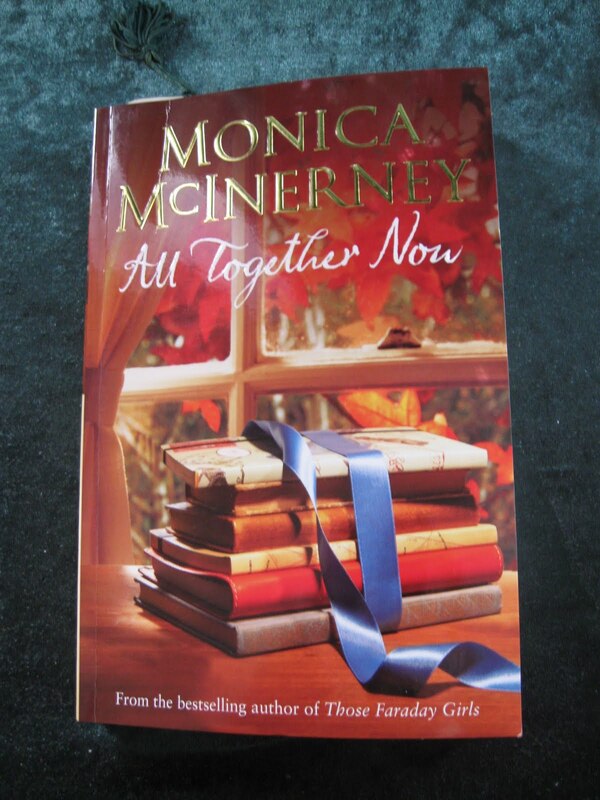 Monica McInerney grew up in a family of seven children in the Clare Valley wine region of South Australia where her father was the railway stationmaster and her mother worked in the local library. Since then Monica has lived all around Australia (in Adelaide, Sydney, Melbourne and Hobart) in Ireland (in County Meath and Dublin) and in London and also travelled widely. Now, for as along there are books, there are people who will belong to two separate groups of readers. There are the people who bookmark a book with just about any thing from a sugar packet to a bus ticket and a napkin; or they'll actually use a very nice, pretty and - at times - expensive bookmark to mark their place in their chosen read. Then, you'll have the dogearers. The people who fold over the top corner of the page to mark the place (and sometimes, that little top corner takes up half a page! 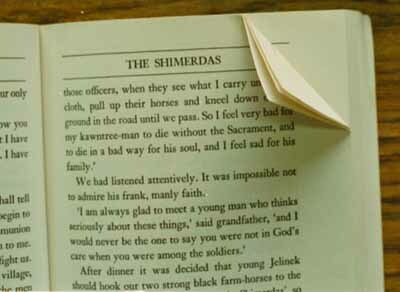 I've seen some books with massive creases in their pages where people have done this and it's left me wondering why!). So, okay, you're stop is coming up and you've got to get off the train or bus; this doesn't mean you have to disrespect the author by flipping over the corner of the page. My collection of bookmarks in my office. Now, I'm no saint. I used to do this in high school until my Grandpa told me that dogearing killed books. He said it weakened the pages and cause them to tear easily if they were dogeared enough. So, he insisted that no matter where I was to try and use a bookmark. It didn't have to be anything fancy; it just had to mark the place in the book, that's all. My Grandpa passed away in 1997 and still, I cringe whenever I see somebody dogear a book; actually I nearly ask them to put a bookmark in instead. But I don't; because it's none of my business what they do to that book if it's from their own personal collection. What I do hate is going into a public library (anywhere around Brisbane) and finding a good lot of their collection has been dogeared at some point in their borrowing lives. Even when the brand new books have come back, their clean, white, pristine pages have been marred with the horrible marks of being dogeared. I must say that books will get damaged during their lives. Their covers will be bumped and torn a little through wear and tear and the tops and bottoms of the spines will acquire a wear mark of where your finger has pushed down on it to pull it off the shelf and push it back on. However, there is no need to dogear a book if you can help it. As you may have noticed, I'm a bookmarker; and yes, I do have a large collection of bookmarks to choose from when I pick up a book to read. I have given my niece and friends bookmarks as little gifts so when they read a book I've lent them, they know I'd like them to use a bookmark. I know that sounds like I'm being a nag, but really I do wish for my books to last more than just my life; but into my niece's generation and beyond. Books are valuable and brilliant things - as you all know - and I do believe that dogearing them isn't exactly the best for them; even though it may be the easiest thing to do at the time. So, what do you do? Are you a dogearer or bookmarker? Do you know anyone who are either of these and you find it frustrating they dogear your books; or do they respect your books as much as you do? Until my next post, happy reading! It's been a while since I've made a post. The reason is that I haven't really been reading all that much; well, I have, but not books. I've begun reading short story books; and I only read these when I've read a massive book or have read a couple of non-fiction and my brain has to unwind a bit. So, what has happened is: I took a month to read 'Acheron' by Sherrilyn Kenyon (which is around 700 pages or so) and found I really didn't wish to get into another book of that size. 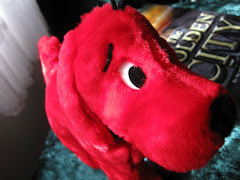 So, I picked up a short story book and began reading... then I found another one around my house got into that one too. They're nice, concise stories that have a great little plot with only a few characters and they really don't require me to do anything much in the way of committing myself into a huge story; not when I've read such a massive book. 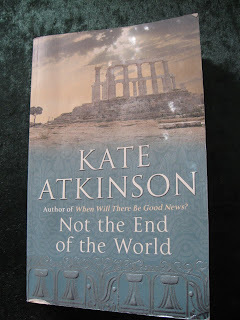 The two books I've been reading are: 'Altogether Now' by Monica MacInerney and 'Not the End of the World' by Kate Atkinson. Both are totally different genres and have different length stories in them; and I love jumping from one to the other to read something different at different times of the day. So, what are you reading that may be differing from the norm? If you're normally a romance reader, are you getting into sci-fi; or maybe you're crime reader and you're trying out literature. Leave a comment and us all know. Until my next post, Happy Reading. The Bro Code is 150 rules of conduct for bros about bros and was written by bros. If you're not a bro, you've got problems. If you're a chick, you're not entitled to knowing the Bro Code; however, if you're a chick and you're known as a bro, then you're more than likely know most of the Bro Codes articles as you've grown up around bros or had close friends who are bros. The Bro Code... if you're a bro and you don't know these rules; well, then, I'm sorry to say this, but, you're not a bro. This book was first mentioned by Barney Stinson in 'How I Met Your Mother'; the hit comedy sitcom on CBS as the main rulebook to live by if you're a bro. Since he's mentioned it, people have wondered what is it; especially Robin (who is a character from Canada and had a lot to learn about America still). Barney is played by Neil Patrick Harris was first on our screens as Dr Doogie Houser. Even though it's been years since his first television show has been on television, they have aired a 'How I Met Your Mother' spin off of one episode; with hilarious results. I found this book funny and interestingly, I also found that my own brother had pulled a few of the Bro Code Articles on me as I was growing up without me knowing it. Born in June 1973, Neil Patrick Harris started out his acting career as a child star and starred in Clara's Heart and Purple People Eater. His big break came when he landed the lead role as the young Dr Doogie Houser in 1989; which made him a household name. He's been in a few other shows and movies until he landed a major role in Joss Whedon's Dr Horrible's Sing-a-long Blog. Otherwise, he has been playing a major womaniser on 'How I Met Your Mother' on CBS for the last few years. Today, I went to Garden City in the search of my monthly magazine 'Good Reading'. 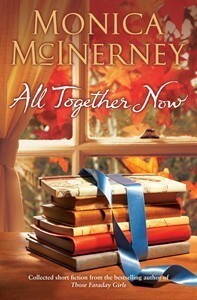 It was there; and has a new cover! So, it took time to find it. But that wasn't all that changed! The whole magazine had a complete change inside and out; and the whole thing looks beautiful and makes you want to read it more when you look at it. Now, that's what a magazine is supposed to do! While I was at Garden City, I had to also pick up some paint and I thought to look through QBD to see what I could find that the way of a great deal (as there's always a great deal in that store), and I found a book that I've been eying off for ages. It's 'The Bro Code' by Barney Stinson and Matt Kuhn. It's a funny book about what the rules are for being a man in the eyes of Barney Stinson (the womanising character from the television hit comedy 'When I Met Your Mother'). I love this show and think these rules are hilarious; and just had to find the book to have a good laugh.